One of my closest friends, Sebastian Zutant, is a sommelier at an excellent restaurant in Washington, DC — Proof. Last week he was touring Tuscany with his wife, visiting vineyards whose wine he features at his restaurant. I rode the train up from Rome to meet them for a couple days, and they took me to a private tasting at Ambrogio e Giovanni Folonari Tenute, a gorgeous and massive estate in the Chianti region. The Folonari family has been in the wine business since the late 1700s, and they now own some 900 hectares of vines scattered throughout the area. The particular estate we visited is their largest — it dates back to the year 1300 — and is the place where their operations are headquartered. Sebastian’s Italian distributor helped arrange this private tasting, which included a quartet of Texans who happened to show up at the right time and beg their way onto the tour. We began in the tasting room, sitting around a twenty-five-foot table, while our host (the woman you see at the head) presented four of their best wines. I’ve gone tasting in California, but I’ve never been part of such a formal and sophisticated affair. We sampled a Chardonnay from the Chianti Classico district, a Sangiovese from the same area, a Sangiovese/Cabernet mix from a nearby region, and finally a Super Tuscan blend of Merlot, Cabernet Sauvignon, Cab Franc, and Petit Verdot. Everyone took notes. I didn’t even pretend to know what any of meant, so I just doodled and focused on my wine. I do know that it was bloody delicious. I have a soft spot for grappa, or perhaps I should call it a hard spot, but anyway I love the stuff. Sebastian’s wife, Lauren, asked a few clever questions that convinced our host to bring out two of their reserve grappas at the end of the tasting. One was made from the Sangiovese wine we had in front of us, so we were able to sip them side-by-side and recognize their parallel qualities. Later they took us to the barrel room and the cellar, and we convinced them to sell us a few bottles of grappa before we jumped back in the rental car and wound through the twisting country roads towards Siena, where we spent a night before returning to Rome. Ora che sporaggiunge lunga sera. Per un non breve nostro separarci. Now that long evening unexpectedly arrives. Of the sorrow of our drawn-out parting. As you likely saw in the news, Germany invaded Poland seventy years ago today, marking the start of WWII. Not only did Poland’s Soviet neighbors fail to come to their aid, but they joined in the invasion, revealing their pact with the Germans. As night fell in New York, the British emigrant W.H. Auden sat in a dive bar — or so his poem begins — realizing along with everyone else that a world war was inevitable. Here’s his poem about that infamous day. (Arguably one of his best works, Auden had mixed feelings about the poem, even trying later to suppress its re-publication.) The final two stanzas, full of a sort of dark hope, are particularly moving. Remember how long you have been putting this off, how many times you have been given a period of grace by the gods and not used it. It is high time now for you to understand the universe of which you are a part, and the governor of that universe of whom you constitute an emanation: and that there is a limit circumscribed to your time — if you do not use it to clear away your clouds, it will be gone, and you will be gone, and the opportunity will not return. with a visiting friend from new york, i went out for an incredible meal last night. a bartender up near the piazza navona had told us about the place, claiming it was arguably the best spot in town. Da i 2 ciccioni is an unlicensed back-alley restaurant where the owner cooks out of his kitchen and serves meals on rickety tables just outside his door. there are no menus — you just eat whatever the gianni happens to be cooking. they delivered some deliciously crisp, house white wine, and then the meal began with three antipasti, pictured below — bruschetta with tomatoes; spicy mashed potatoes with onions, chili pepper and tomatoes; and some tasty beans. [sorry about the quality of the photos; it was a fairly dark alley, which made it difficult to get clear shots.] between courses, gianni’s super-goofy and well-fed dog, aldo, stopped by for some affection. more likely, he was just looking for table scraps. they kept the wine flowing during a short lull, then we choose between three primi [first dishes, usually pasta]. we had the cacio e pepe, which is a simple sauce of sharp pecorino cheese and fresh black pepper; our other pasta was a traditional carbonara, tossed with pancetta, oil, and spices. then we had secondi, the main course. one dish was tender calamari over peas; the other was an amazingly succulent mound of chicken, sautéed with white wine, garlic and rosemary. at the end of the meal, they set a couple bottles of grappa and limoncello on the table for us to help ourselves. we did — generously. as the night grew late, gianni got rowdy. apparently, we weren’t the only ones enjoying the grappa. he sang bits of opera and italian folk songs at a nearby table of his friends, and later he serenaded us personally with his arms spread wide and his head thrown back. damn good voice. before we left, i slipped into the tiny kitchen and took this photo of gianni in his element. he prepares the entire meal on that little stove. The mountain emerges from the clouds. Yesterday I hopped on the 75 bus to the Non-Catholic Cemetery in Testaccio, a neighborhood just south of the Circo Massimo, most known these days for its techno clubs and for one of the best delis in Rome — Volpetti. After eating far too much, I trudged past the shuttered nightclubs to the real local attraction: the resting place of Keats and Shelley. I’ve always had a special love for wandering in graveyards. I’m not sure why. I guess it’s for all the expected reasons — the tranquility, the aesthetics, an attraction to morbidity — but I also like strolling the aisles and reading the names and dates, inventing stories and situations for the deceased. I admire the simplicity of some markers and the shocking ornateness of others. I like calculating how close to one other an old couple died. And I’m interested in the graves of children. [Hm. Reading over that last sentence, I don’t think I’ve ever written anything so creepy.] Anyway, this particular graveyard is reserved for non-Catholic foreigners who die in Rome. Both Keats and Shelley are interred there [even though Shelley died up in Tuscany], along with scores of lesser-known artists, archeologists, expats, and other decomposed citizens of the world. So I kept my distance for a while, steering clear of the other tourists, and went to find Shelley’s resting place, which was surprisingly deserted. I guess poor Percy has fallen out of fashion. Finally Keats’s tomb cleared out, and I claimed that corner of the cemetery. His epitaph is also Shakespearean, inspired by Henry VIII; the original lines read: “Men’s evil manners live in brass; their virtues / We write in water.” Buried beside him is his buddy Joseph Severn, the man who drew the death-bed portrait I included in the post below. The best thing about Keats’s headstone is that his name appears nowhere on it. Either he was arrogant enough to consider it unnecessary, or he was too humble. I like to believe the latter. Old Joe Severn, though, he couldn’t wait to splash his famous friend’s name on his own headstone — and in all-caps, no less. Now we’re talkin’. Despite my indelicate tone, this really is an enchanting place. I plan to visit regularly while I’m here. Oh, and if my travels take a wrong turn and I die in Rome, somebody please shovel me out a little plot of land in the non-Catholic cemetery. And keep my tombstone simple. I spent yesterday at the Keats-Shelley House, a haunted little museum where Keats exhaled his last breath while gazing from his window at the artists’ models lounging on the Spanish Steps. Having been ordered to Italy by his doctor, he only lived here for three months before his consumption killed him. I stood for a while in his tiny room. There’s a fireplace next to the bed where his friend Joseph Severn would often prepare meals for him. The blue ceiling must be twenty-feet high, which gives one the sensation of the walls closing in. It seemed a proper place to die. Beneath a window is Bernini’s Barcaccia sculpture, depicting a sinking boat. At some point during the last century, they turned the apartment into a formidable research library, but now they’ve locked all the books behind oakwood prison bars, so one can only stare longingly at the leather spines of the inmates. But I heard that in old days, they allowed writers, scholars, and other interested people to waste their afternoons in the stacks. It was a common gesture of affection in the time of the Romantics to give someone a lock of hair as a sign of friendship and affection. They have on display locks of hair from the heads of Keats, Shelley, Byron, Leigh Hunt, Elizabeth Browning, and even Milton. Above is a portrait Severn produced of Keats on his death bed. Below are some photos of the museum in the Piazza di Spagna. last night i attended a concert of traditional italian music, an event associated with one of the many music and art series that fill the roman summer calendar. these concerts are staged outdoors at the Teatro di Marcello, an archeological site built in 18 B.C. 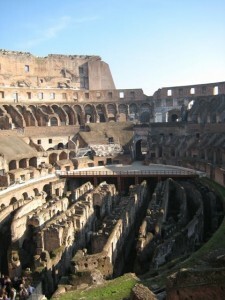 the place looks like a miniature version of the Colosseum. most nights they present classical pianists, but last night they featured a duo of piano and accordion, playing traditional songs, as well as music from old film scores. i’ll post some photos below. 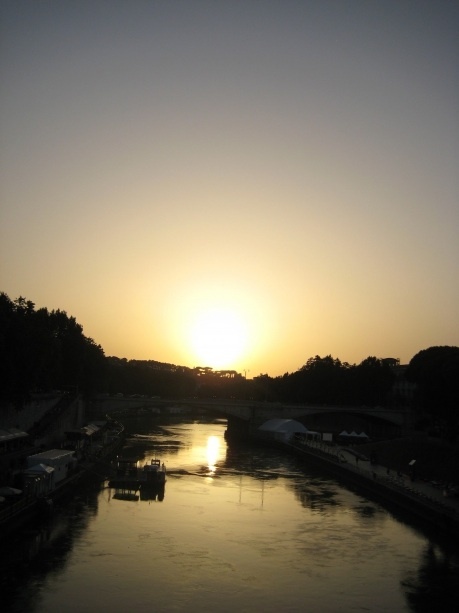 there’s also a photo of the Tiber at sunset, as i crossed the bridge over the Isola Tiberina on my way to the performance. 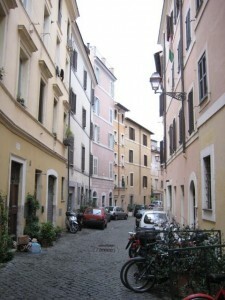 i’m finally here in rome, settling into my new apartment, which is just outside the neighborhood of trastevere. i’ve spent most of my first days unpacking, organizing, getting back to my writing, and exploring the area on foot. i went for a run this morning in Villa Doria Pamphilj, which is rome’s largest park, and only a couple blocks from my place. lonely planet says: “The park was laid out in the 17th century for Prince Camillo Pamphilj, cousin of Pope Innocent X.” much of it has the feel of an African safari, with long stretches of brown earth, spotted with twisted cypress and other dark trees. but as you descend into the lower section, you eventually come to an area with fountains and statuary and a beautiful crumbling villa. i’ve posted some photos of the apartment — my writing space and the patio. 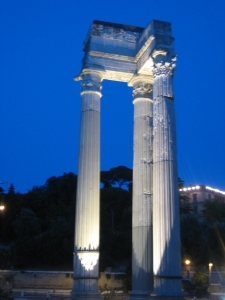 I will be living in Rome from July until October 2009 — working on a novel, sampling the local wines, learning Italian, and exploring the Eternal City. 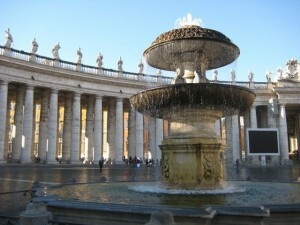 I’ve made arrangements to live in an apartment in the historic district of Trastevere. The flat is owned by a young couple, both artists — she writes detective stories; he’s a sculptor. While there, I’ll also engage in a scholarly study directed by BU’s Rosanna Warren. The course will focus on American and British writers from the past few centuries for whom Rome has been an important literary capital. 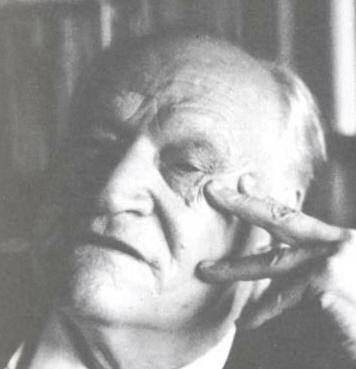 Not only will I read their works that were written in and about Rome, but I’ll also visit the cafes, bars, piazzas, churches, ruins, residences, and cemeteries that those writers still haunt.